Rorschach tests…what do YOU see? First let me tell you how much I personally appreciate all the wonderful words of support and encouragement you’ve given over the past day. I’m going to print out this post, along with the sweet messages of prayer and compassion that you’ve left, and give them to Jimmy’s mother. Thank you, ALL, for being awesome that way. I am so thankful for my kids because they are able to make me laugh when humor seems the farthest thing from possible. On a morning when I literally felt hungover from the sorrow, I got the best gift I could have gotten from Peyton. A reason to just sit back and lose it laughing, accepting the knowledge that no matter how sad and overwhelmed I might be, there are always moments of pure joy to be had. *Warning…if you have a clean, decent mind, this picture won’t even cause you to crack a smile. ***Warning…if your mind is even the tinest bit warped, this picture may blow your gourd! OK, first answer that crosses your mind: WHAT DO YOU SEE IN THE PICTURE? Why, it’s a vase of course, don’t you see the beautiful flowers? Raise your hand if you laughed! Posted in: Having faith, Mayhew niblets, picture fun, things our kids do. OK yeah, you got me. I MUST have a warped mind. After just reading about Jimmy it didn’t make me laugh but it did raise a smile. Thank you Peyton!! I’m sure you like to display your art and I think this is defintely one to be stuck on the front of the fridge! I saw two vases right away. But then again, I’m good at seeing things! The little one on the left is definitely a mug of beer and the one on the right is a bag of golf clubs — see the ball-in-the-water retriever. But I’m a guy. What the hell do I know. Oh Anissa, what a filthy little mind you have!!! The more I look at the picture the funnier it gets. HAHAHAHAHAHASNORT! OK, I have a warped mind! I saw vases full of flowers too — but on second look, I saw what you see! 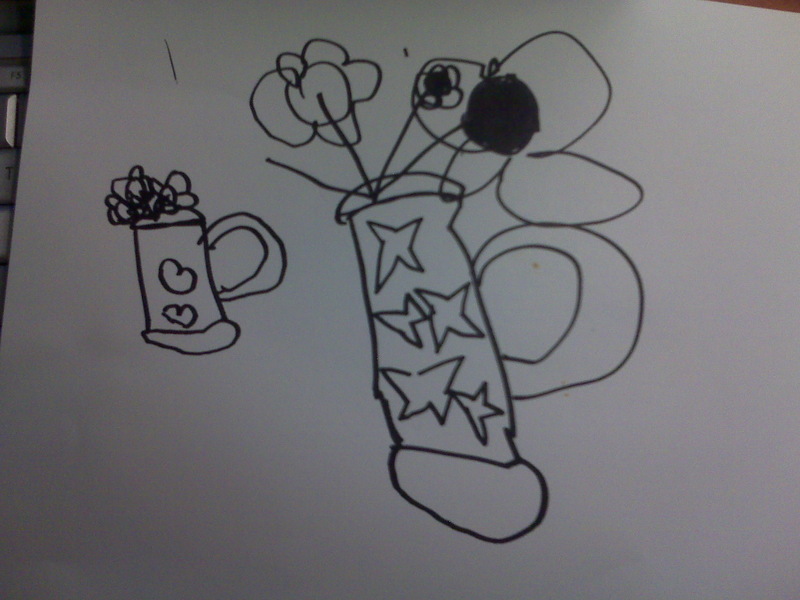 I see two beer steins….with flowers in them. I tried finding something else, even turning my laptop all sorts of directions…..nope……ooowait….ummm, nope. Am I look for a male or female? Okay, I saw a vase of flowers, too! But after being a teacher and having 5 kids – I’m trained well in decoding pictures like this. Peyton is precious, though! Hope this picture is framed high on the fridge – where it always belongs. Praying for your friend and his family. I did not know them – but I feel their pain all too well. May God wrap you all in His peace and love. Ohhhh SERIOUSLY!!! I just came home from church and I still see what I think I see — maybe I need to go back for a second round!!! Natalies last blog post..Too inpatient …. couldn’t wait ….